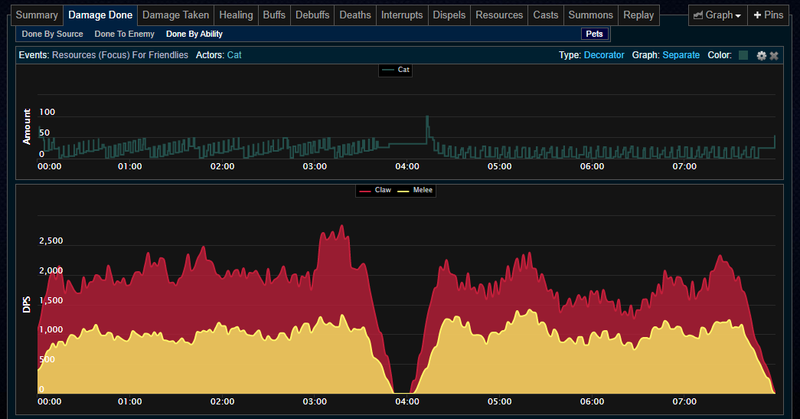 The Thrill Of The Wild: WoD Beta: Steady Focus Affecting Pets? After weeks of getting no response on the hunter forums, beta forums, theorycrafting forums or twitter, I've finally got an answer to "Is the new Steady Focus talent inherited by hunters' pets?" Thanks actually should go to Eurugan (any of you who frequent the WoW hunter forums may know him for his large Walls of Text explaining the intricacies of hunter mechanics), who suggested testing by looking at the number of focus costing attacks our pet can cast in any given amount of time. So I headed down to Shattrath and sent my cat to work. The above shows two, roughly 3 minute segments of pet DPS. The first half is with Steady Focus, and the second half is without Steady Focus. The top graph, which I thought was pretty interesting, shows a rough graph of how much focus my pet had during the fight; though WCL, even with advanced combat logging, doesn't keep close enough records for this graph to accurately show focus gains, it does give us a good visual of the over all focus trends with and without steady focus. If you can't guess by looking at it, Steady Focus is inherited by our pets. That means, baseline, with steady focus up, our pets are seeing 7.5 focus generated every second (plus the haste multiplier). In 660 PvP gear, my pet had enough focus regen to not only cast its basic attack on CD, but to build focus while doing so, leading to an extra Wild Hunt double damage attack a little bit more than twice a minute (sure, that's not a lot, but if you choose this with BM, and get much luck with Go for the Throat, this could be a lot more often). For those interested, over 3 minutes, with Steady Focus I had 56 Claws (that's 1 per minute less than using it exactly on CD, since the first Claw after Wild Hunt takes an extra second to build up enough focus), where as without Steady Focus, I only had 42 Claws in 3 minutes. Both of these tests started with full focus, so the w/o SF number is actually a bit inflated, regarding how many Basic Attacks you'd have per minute over the course of a fight. It's yet to be seen if this is actually going to make this talent viable, while it still has to compete with Thrill of the Hunt and Dire Beast. I haven't tested this with BM yet to see if it has much effect, after adding in the extra focus from Go for the Throat. It's going to take a bit of arithmetical magic to see how this compares to Dire Beast, for BM. But at least now that I know Steady Focus affects our pets I can make an accurate comparison. Good testing, and glad you finally got an answer to your question!